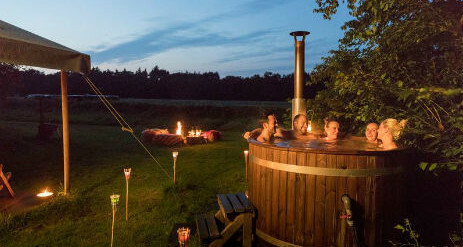 With only an hour from Birmingham and an hour and a half from Manchester, Upper Shadymoor Farm in Shropshire with optional hot tub feels worlds away from both. 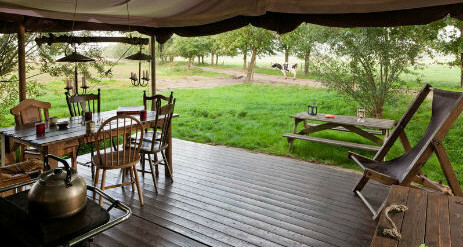 The farm is nestled in a woodland glade and is situated on the Welsh border in the Shropshire Marches. It boasts beautiful walks both around the farm and over Long Mynd and Stiperstones. Set out for a day of exploring and stop to refuel at one of the many country pubs dotted along the walking routes or take a dip in the farms very own swimming lake! There are a number of extra activities available which are unique to Shadymoor Farm, including pony craft and grooming and the Deer Safari and Dusk Adventure. There is also children’s arts & crafts sessions and the “Game On” weekend game cooking class – the possibilities for family holiday fun are almost endless! 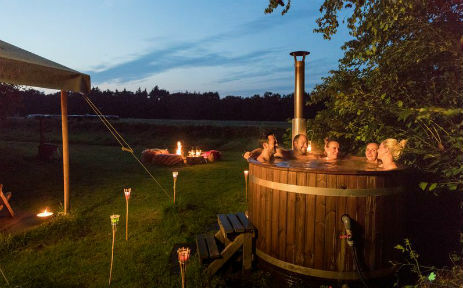 A particularly special treat is the hot tub, water trampoline, boating and wild swim water package. It’s an Upper Shadymoor delight for the whole family! You may even spot a Red Deer while you swim! 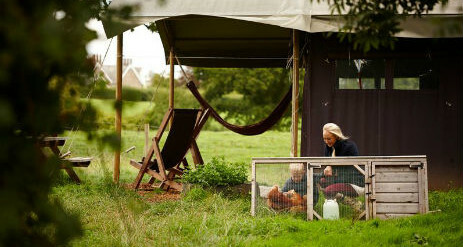 The real star of Upper Shadymoor Farm is nature itself. 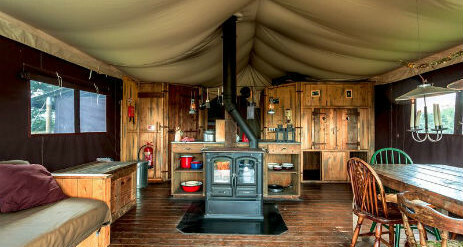 The environment has been enhanced by a decade and a half of conservation, and is the perfect backdrop for your Shropshire glamping farm holiday. Bluebell woods and wild garlic flourish alongside Kerry Hill sheep, deer, horses, goats, pigs, chickens and the farm dogs. Meet Mouse the dog, Goose the Clumber Spaniel and Dormouse the miniature Shetland! Unfortunately, guests’ pets can’t come along and meet them as the farm is home to many birds. The farm larder is located in the wainhouse, where you can order fresh bread and the farm’s zero-food-miles venison, pigeon, pheasant and duck, plus Kevan’s ready-cooked meals. 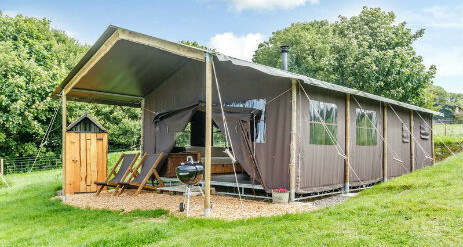 Both the wainhouse and the new summer house overlook the hot tub and lake, and make perfect luxury camping venues for special parties big or small. The Medieval towns of Shrewsbury and Ludlow are beyond the farm, if you want to explore the area further.